Imagine for a moment, an exemption to a rule or regulation that completely undermines its protections, to the point that the regulation is fundamentally broken. For example, imagine if seatbelts were compulsory at all times…except at night, in wet weather, or when driving on unsealed roads? Except that we don’t have to imagine such an absurd scenario, because a real life example already exists. The rules governing TV advertising are that alcohol ads should not be shown before 8:30pm. That’s because alcohol is a dangerous, albeit legal, drug and not suitable for children. But…there’s an exemption, and it’s a big one. Alcohol advertising can be shown on TV before 8:30pm on weekends and public holidays during sporting broadcasts. This is an exemption that guarantees alcohol advertising will be broadcast at a time when children will see it and during sporting broadcasts they are guaranteed to be watching. It’s an exemption that ensures children will be exposed to the very alcohol advertising the regulation was designed to protect against. This week the Foundation for Alcohol Research and Education (FARE) and its partners – including St Vincent’s – released new polling that shows an overwhelming majority of Australians, 81 per cent in fact, believe that the alcohol industry shouldn’t be allowed to advertise alcohol during children’s viewing hours. Unfortunately, thanks to the completely nonsensical exemption, it does. Now, with the Ashes Test underway, we must all prepare for the coming onslaught of alcohol advertising and promotion, both during the ad breaks, and, thanks to Cricket Australia’s partnership with Lion’s XXXX Gold, during the broadcast itself. And Australians aren’t happy about it. FARE’s Galaxy Research polling found a majority of Australians (57 per cent) are concerned that their children are being exposed to brewer, Lion’s XXXX Gold alcohol advertising. The reality is the deluge of XXXX cricket advertising and promotion has begun well before the first ball has even been bowled. Take Lion’s XXXX Gold summer Goldie promotion which has all the characteristics of a campaign designed to appeal to children: a tech enabled cricket cap in Australia’s colours; a sporting hero, the smiling former Australian Test cricketer Adam Gilchrist, to idolise; and free cricket merchandise to win. The campaign ticks all the boxes. Lion will argue that the promotion, with caps given away in specially marked packs of XXXX Gold or from participating venues, is aimed at adults. No doubt, Lion will also point to its age-gated website and competition eligibility, with prizes only open to people aged 18 plus as further proof. Yet age-gated websites are effortlessly entered by anyone who can enter four numbers. And while adults might have to enter the competition, it is children who will covet the prizes and play beach cricket while wearing the XXXX Goldie caps and emulating their sporting heroes. Lion are counting on it. For a moment earlier this year, when Cricket Australia and Carlton United Breweries ended a 20 year partnership, it seemed we might be entering an era of greater corporate responsibility. And it’s true that Lion’s deal doesn’t extend to uniform placement unlike the previous VB sponsorship arrangement, or series naming rights, with Gillette replacing VB in the up-coming One Day International series in January. But what remains still means Australian children will be exposed to dangerous levels of alcohol advertising. Dangerous, because all the evidence shows that the greater the exposure, the greater the chances of them drinking earlier, and drinking more. Which is why we can’t stand by the sidelines and wait for our professional sporting codes to do what’s right. 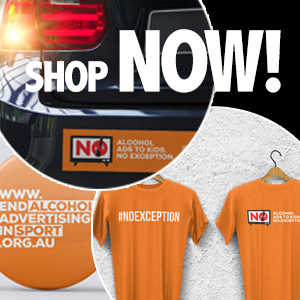 The Galaxy Research polling found almost two thirds of Australians (64 per cent) believe that Australia’s political leaders should be doing more to address the issue of alcohol sponsorship in sport. The Commonwealth Government has both the responsibility and the power to act on this issue. You can help encourage the Government to act by contacting your Federal MP to register your concerns and ensure the Government hears and heeds our message.